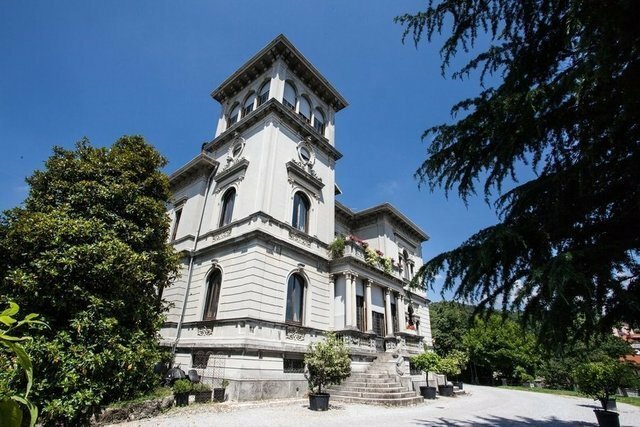 Great period villa in Art Nouveau style built in 1920 following the project of the famous architect Federico Frigerio, known for having designed the Tempio Voltiano, one of the most important monuments of the city of Como and other private villas. Frigerio also took care of the renovation of the dome of the Duomo of Como damaged by a fire in 1935. The villa is currently divided into three apartments, one on each floor, and is characterized by prestigious elements such as an imposing stone staircase, antique fireplaces, coffered ceilings and inlaid parquet floors. The property is accessible from an entrance on the ground floor, through a wide atrium that includes the staircase. From here it is possible to enter the dining room with fireplace, the living room with fireplace, the kitchen and two bedrooms with two bathrooms. At this level there is also a large veranda overlooking the garden. On the first floor, there is a living room with fireplace, a dining room, a large kitchen, three bedrooms, one of which is a large master bedroom, two bathrooms and two terraces. The attic floor features ceilings with exposed wood beams and is characterized by a large living area, composed of living room, dining area and open kitchen, studio, two bedrooms and two bathrooms. From the second floor you have access to the tower with a 360° panoramic view. In the basement, in addition to the cellars and the technical room, there is a practical one-room apartment. The villa is surrounded by a large garden in Art Nouveau style, adorned with stairs, parapets, fish tank with grotto, concrete walls of the era, centuries-old and flowering plants. Within the park there are a rustic buildind and a large disused swimming pool, which need a complete renovation. This is a prestigious property suitable for an extended family or a person who wants very large spaces with historical features. Separately from the villa is sold also the janitor's quarter of about 150 sqm with independent entrance, external from the main property, with a rental contract until 2025.